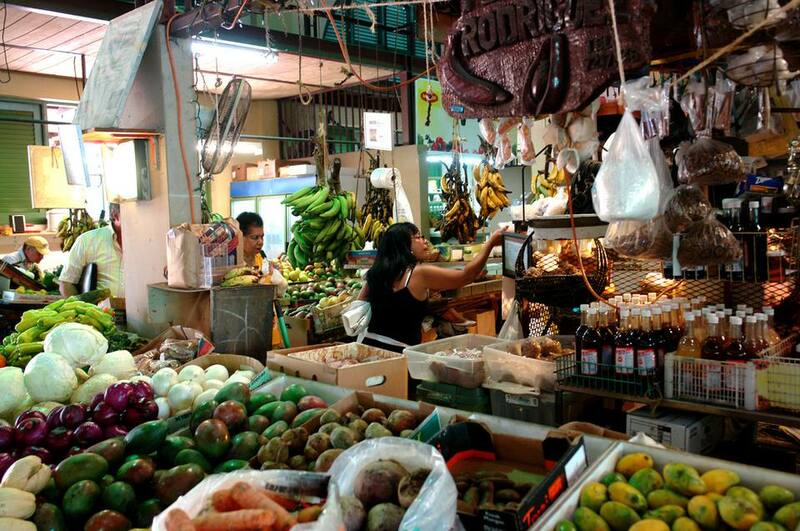 La Plaza del Mercado in Santurce is a slice of typical Puerto Rico. Located across the Baldorioty de Castro Highway (on the other side of Condado) at Dos Hermanos and Capitol Streets in San Juan's blue-collar neighborhood, the Santurce Marketplace is a quaint square with a colorful central building fronting giant avocado sculptures. Inside is a traditional market where, during the day, you can find fruits, vegetables, herbs, and other local produce. Around the market, fondas, or local eateries, and bars line the plaza. From Thursday to Sunday, La Placita transforms into a crowded, lively, and boisterous block party. If you want to experience the flavor and vibe of Puerto Rico, the Plaza is about as authentic a destination as I can recommend. During the day, come to browse the wares at the local stalls, sample a fresh milkshake or fruit juice, or dine at one of the small eateries serving comida criolla. And if you want to hang out with the locals at night, you'll find plenty of them out and about at La Placita; so many, in fact, that parking here is a near-impossibility on the weekends, and you'll want to cab it back and forth. Cheap drinks, loud music, and a pleasant social vibe make this a fun place to relax and mingle. El Coco de Luis, located at Dos Hermanos and Capitol Streets. This small eatery serves up cheap meals and their special whiskey and fresh coconut water cocktail. Tasca el Pescador located right across from the main building on Dos Hermanos Street. You can't miss the neon sign or the bright green building; this is probably the best place in La Placita for tasty, fresh fish and seafood. Jose Enrique is hidden inside a nondescript house on a quiet corner of Duffaut Street, a block away from the main plaza. This small, dinner-only place is revered by locals for its scrumptious local fare that is far more creative and upscale than you'd imagine. Fat Tuesday, on Dos Hermanos Street across from the main building of the plaza, anchors the nocturnal scene at La Placita from Wednesday to Sunday. Come for the DJs and the daiquiris.